Around these parts, we all love to eat. Well, Jasper is going through a deeply suspicious food, but the foods he likes — blueberry pancakes, roasted chicken, and sliced apples — he really likes. Our dining room table is a gathering place, a place to reconnect, a place to enjoy nourishing our bodies. Sage has been joining us at the table almost since the very beginning, tucked into a lap. Though she was exclusively breastfeeding, she was still able to be a part of the family circle and take in all the sights and sounds that family dinner-time has to offer. Now that she’s a little older, she joins us for dinner, sitting in a booster seat on a chair, pulled up to the table. For breakfast and snacks, she and Jasper usually sit together at a smaller weaning table, with a safe and supportive weaning chair just her size. 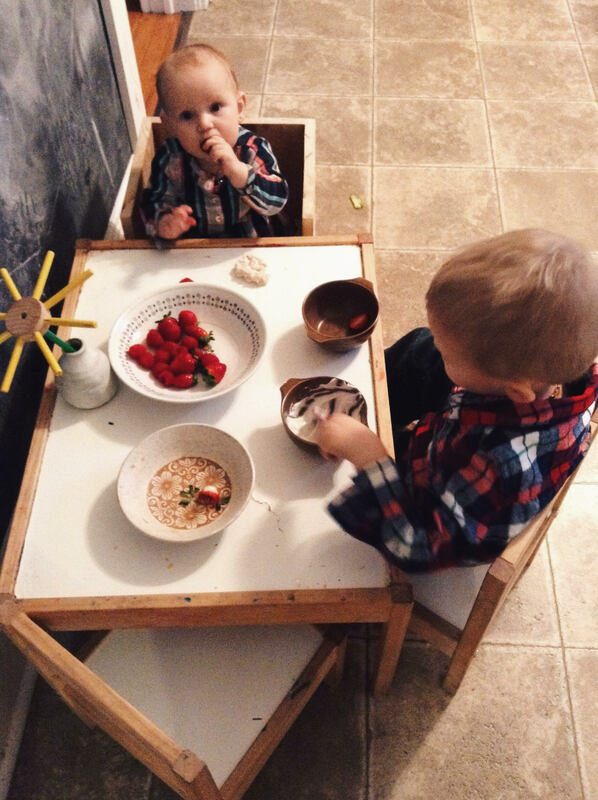 Some Montessorians choose to let a baby eat at the weaning table for every meal, but time spent sharing a meal together is an important part of our family’s culture. We all use ceramic dishes and real glassware, modelling safe and proper usage, while allowing the kids to learn that things can break (rather than introducing glass for the first time later, and watching a four year old have to learn that he can’t toss glass around the way he’s done for years with his plastic cups). At ten months, Sage drinks from an open glass with a bit of assistance holding it to her mouth. With both Jasper and Sage, we’ve followed the self-feeding or baby-led weaning method, meaning that rather than pureeing food and spoon feeding it, food is offered in larger pieces that the baby then feeds to herself. It’s safe, simple and allows the baby to decide when she’s had enough to eat. Independence in eating comes with a bunch of benefits, from healthy habits to less time in the kitchen, but there is one big trade off: it’s a messy business. If you’ve got a dog who likes to clean up under the table, they’ll be in heaven. I haven’t got a dog, but a three year old with a Swiffer mop is a pretty good substitute, and I’m counting down the days till summer heralds the season of dining alfresco. If you’re starting to think about feeding your baby, I recommend checking out this post from How We Montessori, which compares the traditional Montessori method with baby-led weaning. For a full run-down of essentials, check this great post on Midwest Montessori.